Coffee tastes better on time. So much for going out with a bang. I did intend to finish up the week slash month with a real powerhouse of a depressing real life comic, but alas, it seems not meant to be. It’s almost midnight and I’ve only got about half the script nailed down. I lettered the part that felt certain, but even if I had the entire script, it would be 1 a.m. before I even started the illustrating part, which takes a lot longer. 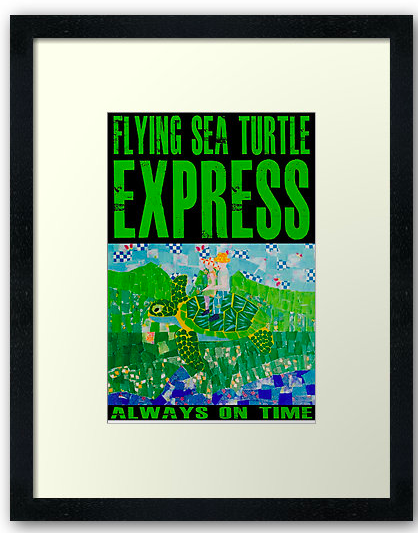 So, instead, please welcome the newest addition to the RedBubble QWERTYvsDvorak store: the Flying Sea Turtle Express. Get it on a mug! Yeah, it’s the design from my sister’s wedding, but I thought it would look good in other formats, too. It works as a poster, too. Hang it on the wall. 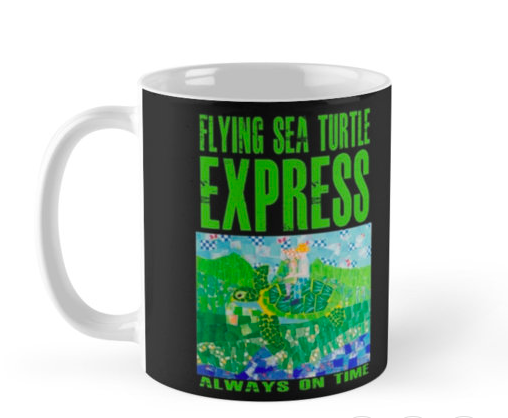 If you would like to peruse a wide selection of Flying Sea Turtle Express projects, including shirts, hoodies, skirts, and leggings, you can click here. In the meantime, I’ll head back to my depressing comic and try to get the script worked out tonight and you can see it in November. This entry was posted in T-shirts and tagged mugs, nature, posters, redbubble, turtle on October 30, 2015 by littledragonblue. The rock is also suitable for children with lactose intolerance, chemical sensitivity, and peanut allergies. 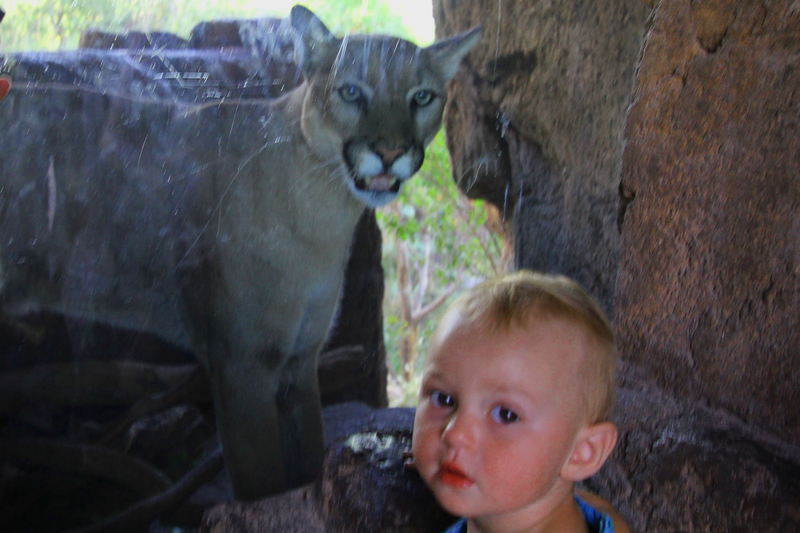 Not recommended for kids with behavior disorders, though. There will be no teal pumpkin in front of my house this Halloween; at the rate I’m going this year, there will be no pumpkins at all, let alone jack-o-lanterns, unless we obtain and carve them Friday afternoon or Saturday morning. I feel for kids with allergies. Personally, the list of things I can’t eat anymore is almost as long as the things I like these days, but there are just too many variables, and my budget for candy is pretty small anyway. Plus, we rarely get more than 2 dozen kids, and half the time we take off around 8 to go to a party. If you haven’t seen It’s the Great Pumpkin, Charlie Brown, it’s worth 21 minutes of your time. I mean, media-wise, the ’60s were a simpler time. There are no explosions, no gore, and nothing the least bit scary, but it’s still a Halloween classic, in its way. For many months now, I’ve been turning over an idea for another big, serious, depressing comic about my childhood, something that I’ve written about in longer prose work, but couldn’t quite figure out how to frame it in comic format. Today the way in seems to have revealed itself, but there wasn’t a chance to get it started because I went to 6 shoe stores unsuccessfully searching for a pair of minimalist sneakers identical to the pair I’ve been wearing since 2012 instead of drawing a long comic. Maybe tomorrow. Or at least get it started tomorrow, as I now realize that today is only Thursday. 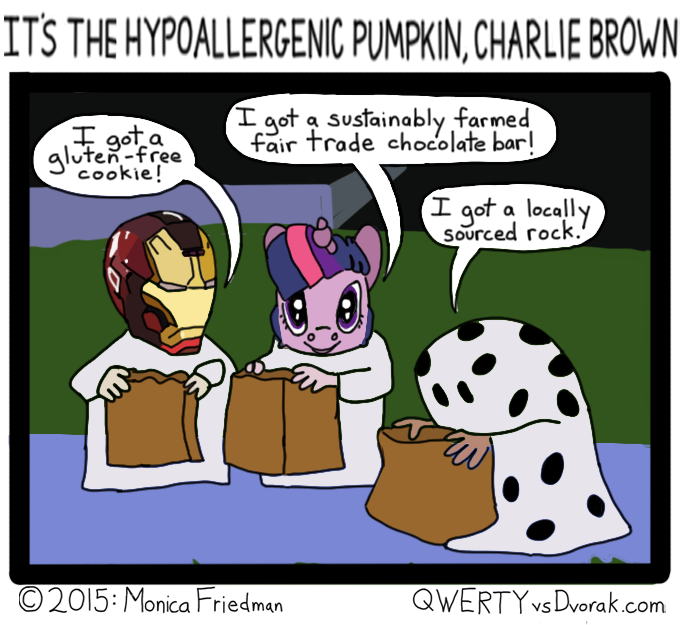 This entry was posted in comic, webcomic and tagged allergies, candy, charlie brown, chocolate, comic, funny, gluten free, halloween, peanuts, treats, trick or treat, webcomic on October 29, 2015 by littledragonblue. You’re both so ugly people go as you for Halloween. Special fangs to the dear friend (referred to, here and there in Dragon comics as the Vampire Bat, for reasons that must soon become clear) who sends out Halloween care packages every year and in whose honor this spooky insult comic was created. Most of the items in the image are from this year’s Halloween box; one is from a few years ago, and there’s also a commemorative matchbook for Bonnie Jo Campbell’s first novel, Q Road. You can’t make it out that well, but it’s a pumpkin with a butcher’s knife sticking out of it. Anyway, these buttons cracked me up the most. The jack-o-lantern especially looks like a real jerk. Sadly, I still live in the desert, so all the chocolate in the Halloween box melted. However, the box itself is pretty nice. 1000 household uses. Skull Face and Jack-o-Lantern may insult each other in front of it again in the future. So spooky! Ah, it’s all in good fun. Tomorrow I have a photo shoot for a hair color blog. Financial remuneration has been suggested. Art! 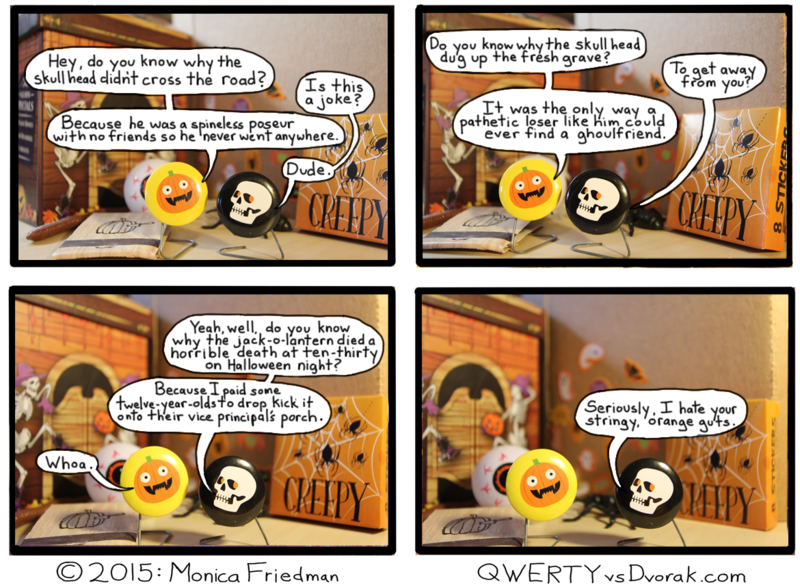 This entry was posted in 3D, comic and tagged 3d, comic, creepy, halloween, insults, jack-o-lantern, photoshop, pumpkin, scary, skeleton, skull, spooky on October 28, 2015 by littledragonblue. The pencil is mightier than the fang. Usually, I like to think of myself as a pretty calm and thoughtful dragon, but sometimes, lately, for example, the little foibles of humanity can enrage me. I was seriously screaming at clueless drivers who were completely innocent of the rules of the road, especially those pertaining to the 4-way stop, and one car in particular not only almost caused an accident, then made 2 turns and a lane change without signaling. The driver remained blithely unaware of the mayhem he left in his wake. It’s rare that someone dates to disrespect me to my face, though. Not since the late ’80s, anyway. Usually, if anyone tries, I cut them right down because I’m proactive like that. Every so often, for political reasons, I find it more prudent to smile and pretend. And then stew. And then make them a low level villain in a novel. Anyway, I think this comic helps. The greatest thing you can do to someone who is rude to you is kill them with kindness. Smile and give them a big hug whenever you walk by. Call out their name and wave if they unexpectedly enter the room. Or, you can draw a hilarious caricature of them and pass it around to people sympathetic to your cause. In the end, dragons stay dragons. And vulgar, constipated people stay vulgar, constipated people. Eventually, most people work out which is which. 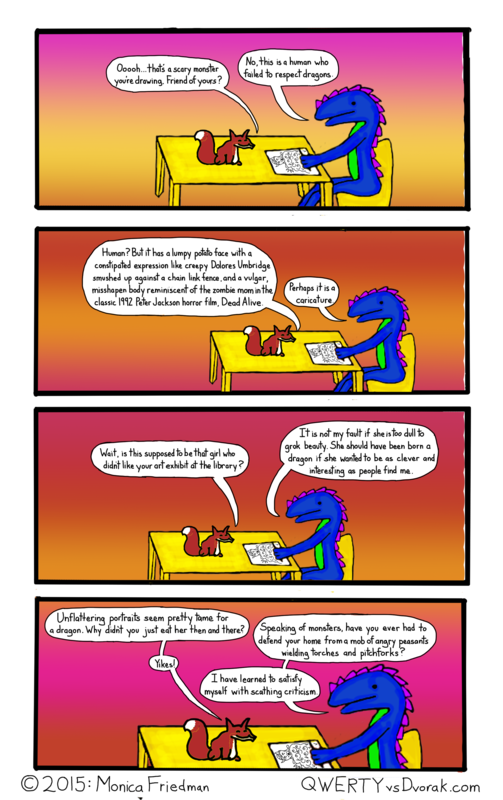 This entry was posted in dragon comics and tagged caricature, dragon, drawing, fox, mean, payback, retaliation on October 27, 2015 by littledragonblue. 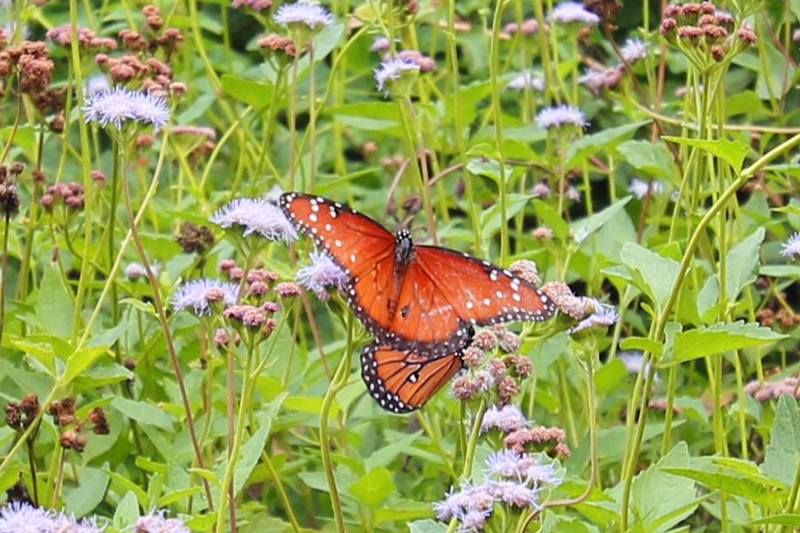 Gentle pastels, like the ’80s when the ’80s weren’t flashing eye-gouging florescence as they so often did. This weekend I probably had too much fun. Party on Friday, party on Saturday, long nature hike with the Fox on Sunday. Obviously, I got nothing accomplished. My new T-shirt design remains in my head, as do numerous comic strips, graphic novel panels, short stories, and novels. I wrote a sonnet in honor of a friend’s birthday. A sonnet is something I haven’t written in years, but that’s what the Fox does for special occasions and it seemed appropriate. Constrained forms are actually easier for me. Then, I thought, why not write it out with pen and ink? But it had been so long since I’d used the materials that it didn’t work out as planned. I ended up doing 3 drafts, none of which were especially pretty. The best version still ended up with fingerprints and smudges all over it, and the handwriting was nothing special. Also, there was ink all over the floor, and all over me. My friend loved the poem–I knew he’d rather have a personal present that I made–but after thanking me for it, he said he was going to frame it. So now everyone will see my lack of command over my materials. 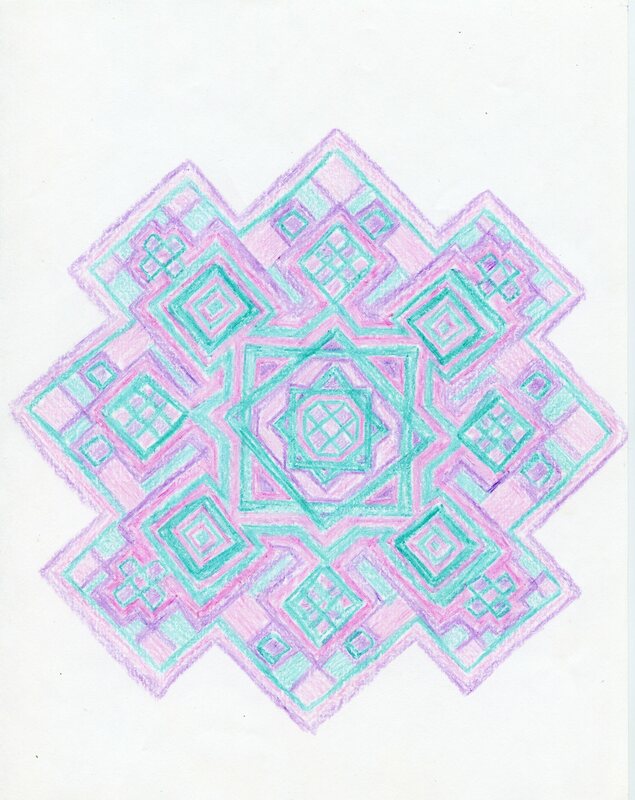 This entry was posted in mandala and tagged ink, mandala, party, pastel, pen and ink, poem, sonnet on October 26, 2015 by littledragonblue.